For anyone who has played or enjoyed reading about wandering cricket, this book is a must. First things first, though, and this is an even more honourable book because all proceeds from the book - excluding postal costs - are going to the Chance To Shine charity. 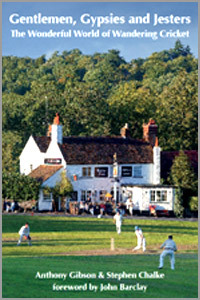 Although the book is written by Anthony Gibson and Stephen Chalke, Stephen points out that the book is the brainchild of Simon Dyson who is a driving force in the Chance to Shine project and trustee of the Cricket Foundation whose idea it was to write about wandering cricket and donating the proceeds to Chance To Shine. In his foreword, Simon explains that " before C2S started in 2005, fewer than 10 per cent of state schools played any form of meaningful cricket. Seven years on, C2S is the single biggest school sports initiative in the UK. In that time over 1.8 million children have been "educated through cricket" in almost 30 per cent (6,500) of our state schools. The programme is inclusive and crosses social, ethnic and gender divides. Nearly half of the children (46 per cent) are girls, and six of the England Women's cricket team are employed as coaching ambassadors." Having played and been associated with a few wandering cricket clubs, I naturally found Gentlemen, Gypsies and Jesters - the names of some of the almost eighty clubs featured - tremendously interesting and brought back fond memories. Personal memories of the Cricket Society were of the wonderfully scenic and, in some cases, historical grounds on which they have played including Broadhalfpenny Down and Blenheim Palace. There were the quirky grounds where you might find yourself fielding on the boundary with the occasional car passing though and I am sure that many of the clubs featured also have their fair share of similar memories and marvellous settings. All the main clubs have a thoroughly decent write-up and most are lavishly presented with photographs and the club colours. Team photos with names accompany many of the articles and the 320 page does great justice to not just existing clubs but also mentions other clubs sadly no longer in existence and briefer resumes of other wandering clubs. It is wonderful that Anthony Gibson and Stephen Chalke have added to the collection of cricket books by bringing a history of this worthy pursuit to our bookshelves. Where else do you find names of clubs ranging from Latin - Quidnuncs meaning, literally, what now and Incogniti - to possible eating exploits, Devon Dumplings, to, well, possible physical difficulties in Invalids. Gentlemen, Gypsies and Jesters is not just about wandering clubs and the history of the Public Schools Old Boys cricket which started in 1967 and is still going strong today, is also detailed. Steve Pittard writes a very interesting chapter on this pointing out that, what could possibly be the strongest side, Old Millfieldians, provider of many Somerset players through the years, do not put out a side. Anthony Gibson shows the reader that good writing continues to run in his family whilst any book bearing the name of Stephen Chalke is bound to be worth reading. Coupled with a foreword by the admirable John Barclay and the, as usual, impeccable presentation and quality of this further Fairfield Books publication, this book is a very welcome addition to any cricket lover's library and supports a very worthy cause.